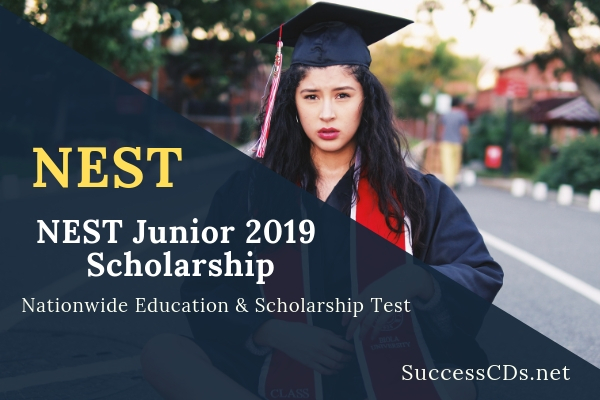 NEST Scholarship 2019 (Junior) - Applications are invited from Indian students of all schools/colleges of Class 9th, 10th, 11th, 12th (Science Stream only) and Diploma Engineering (1st and 2nd Year) for the award of several scholarship worth Rs.25000/- to Rs.50,000/- each. Registrations are open now for NEST-JUNIOR SCHOLARSHIPS for class 09th, 10th, 11th, 12th (Sci.) & Dip Engineering (1st & 2nd Yr.). Rs. 25,000/- each to the top 10 scorers (with Rs. 40,000/- to Rank #1) in NEST-JUNIOR-I category. Rs. 30,000/- each to the top 10 scorers (with Rs. 50,000/- to Rank #1) in NEST-JUNIOR-II category. Certificates of Appreciation are awarded to all high scoring candidates in the test with All India Ranking (AIR). Certificate of Appreciation shall be awarded to all candidates who score aggregate of 40% and above of all the sections put together in the test. They will download their Scorecard and Certificates of Appreciation one month after the declaration of the result. NEST-Junior-I: General based on class 8th & 9th books as prescribed by the NCERT of India. However, it may also include questions based on class 6th & 7th. NEST-Junior-II: Generally based on SSC and HSC books as prescribed by the CBSE, ICSE and other State Boards in India. However, the main focus will be on class 10th and 11th books. In all State Capitals and other major cities of India as given are Agra, Ahmedabad, Allahabad, Amritsar, Aurangabad, Bangalore, Bhopal, Bhubaneshwar, Chandigarh, Chennai, Coimbatore, Cuttack, Dehradun, Delhi & NCR, Dhanbad, Durgapur, Ernakulam (Cochin), Gangtok, Goa, Gorakhpur, Guwahati, Gwalior, Hubli, Hyderabad, Indore, Itanagar, Jabalpur, Jaipur, Jammu, Jamshedpur, Jhansi, Kanpur, Kolhapur, Kolkata, Kozhikode, Latur, Lucknow, Ludhiana, Madurai, Mangalore, Meerut, Mumbai and Suburbs, Mysore, Nagpur, Nashik, Nellore, Patna, Pondicherry, Pune, Rajahmundry, Rajkot, Ranchi, Rohtak, Rourkela, Shimla, Srinagar, Trichy, Trivandrum, Vadodara, Varanasi, Vijayawada, Visakhapatnam etc. Please log on to www.nest.net.in to apply and pay fees online. Step 3: Read the instructions carefully and Click Proceed for Registration button available in the bottom of the page.